Leftover mashed potatoes aren't very good if you just reheat them and serve them as is. You have to add something to them to make them flavorful. Potato patties are a great way to use up this ingredient to make another recipe that is crisp, hot, and delicious. This easy recipe is loved by everyone. 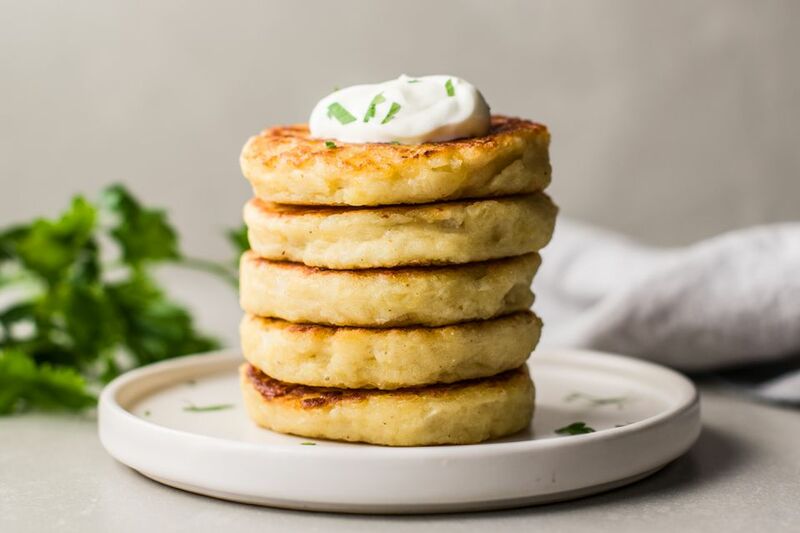 Use leftover mashed potatoes from Thanksgiving dinner to make these delicious, crisp potato patties. Crispy Potato Patties are a classic side dish, perfect to serve with everything from meatloaf to roasted chicken. Or you can serve them as an appetizer. You can also make potatoes especially for this recipe. Try using dried potato flakes; they are a quality product and make really good mashed potatoes. Follow the package directions carefully. And remember to cool the potatoes thoroughly before you start this recipe. You could use other types of cheese in this recipe: grated Cheddar, Swiss, Muenster, or Havarti would be good. Or try seasoning them with dried herbs, from thyme to marjoram to basil. For more nutrition, you could sneak in some mashed cauliflower or some finely shredded carrots. You can keep these patties warm in a 250 F oven for about 20 to 30 minutes before serving if you like. They will stay crisp on the outside and tender on the inside. Serve these little patties with meatloaf, roast chicken, or grilled steak. I like to serve them with ketchup or with a sauce made by combining mustard and mayonnaise or sour cream. Everyone loves them, including small children. Mix together the mashed potatoes, beaten egg, and onion in a medium bowl. Add the flour, cheese, salt, and pepper, and stir well with a wooden spoon. Drop about 1/4 cup of the potato mixture into the frying pan, patting it into 3-inch circles that are about 1/2-inch thick. Cook the potato patties until the bottom is browned and crisp, which will take about 3 to 4 minutes. Carefully turn each patty over with a spatula and cook the second side until it is brown and crisp, about 3 to 4 minutes longer. Serve the patties immediately with ketchup or salsa or any other sauce you'd like.